Thanksgiving is one time of the year when most Americans eat seasonal native foods. Or at least the squash, pumpkin, corn, turkey and cranberries were all native and seasonal in Massachusetts where the Pilgrims celebrated their first successful harvest in the New World in 1621. What’s rarely mentioned is that Pilgrims also had acorns on the menu, likely in the form of bread made from acorn flour. of plants, animals, and fungi that all play different, beneficial roles in the ecosystem. Over the centuries that followed, Americans abandoned acorns, even though native peoples across the country used the biannual oak harvest as one of their staple food sources. Now regarded as feed for deer, or just a garden nuisance, the acorns from all oak trees are perfectly edible. And the trees are particularly prolific: The oak harvest in North America amounts to more than the annual yield of all other nut trees combined. With over 60 species of oaks spread across the country, it’s worth reviving acorn foods now for several reasons. This past summer’s unrelenting drought across America’s breadbasket highlighted major failings of an industrial agricultural system that’s based on annual plants like corn, wheat, and soy — monoculture crops that are dependent on massive inputs of water, fertilizer, and pesticides and leave us vulnerable to the vagaries of climate change. 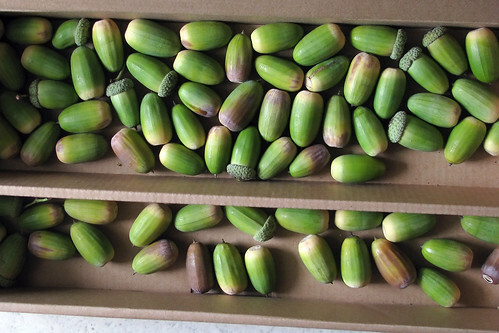 Compared to industrial wheat production, the cultivation of acorns requires one-tenth the water and resource consumption and provides a food source with higher nutritional content. Acorn kernels provide a complete vegetable protein, and they are full of minerals and vitamins that are absent in refined wheat. Oak tree groves are the opposite of monoculture — they can support hundreds of other species of plants, animals, and fungi that all play different, beneficial roles in the ecosystem. Take one oak-rich state as an example — California would be able to transition to oak agricultural production right away. The state’s area of oak “orchards” is nearly 13 million acres, equivalent toone-eighth of the state’s area. Excluding tan oaks, which are now widely infected with the sudden oak death pathogen (and aren’t technically classifiable as oaks), the other species of oak trees (coast live oak, red oaks, canyon oaks, black oaks, etc) require little to no maintenance and are extremely adaptable. Even if only a fraction of these trees were harvested, the amount of acorns would greatly surpass the annual production of 1.3 million tons of wheat. The crop would require no irrigation, no pesticides or herbicides, and no yearly replanting. While oaks do take an average of two to three decades to grow to reproductive maturity, there are enough productive existing trees in California to support a thriving acorn market, without depriving the regular diners from the animal kingdom. Acorn flour is similar to any mild grain — it easily takes on the flavor of other ingredients, says Jolie Lonner Egert, an ethno-botanist in Fairfax, CA who has been harvesting the nuts and experimenting with acorn culinary traditions for the past several years. Egert — whose company, Go Wild Consulting, leads classes on foraging and ecology — has revived recipes for acorn biscuits, pancakes and porridges. She is hopeful that the gluten-free trend in American cuisine could make acorn flour, which does not contain gluten, more appealing to mainstream consumers who are becoming more and more aware of medical studies linking gluten in wheat products to a range of health issues. “We need to rethink our relationship with what nourishes us,” Egert says. “Wheat is getting us sick on so many levels, and our addiction to it is now being recognized as harmful to our health, as well as to our soil, our water and our land.” Egert also believes that acorn harvesting, processing and milling can create jobs. “Gathering acorns is relatively easy, so it’s great for people with disabilities, the homeless, or teen workers,” she says. Every fall during acorn harvest season, Egert employs workers to collect the nuts, paying them $2-$3 per pound collected. One person can gather a pound of acorns in a few minutes, so the job becomes quite lucrative. Each pound of acorns, after going through a 3-day tannin-extracting process, produces about a cup and a half of flour. The yield from an average tree can be 500 or more pounds in a good year, but the downside to acorn production is that a lean year might yield only 25 pounds of acorns. And there’s no way to predict a lean year beforehand. It also takes an oak tree 18 months to grow an acorn, so the harvests from individual trees only come every two years. Click here for more information on collecting, processing, and cooking with acorns.